The high platforms are unusual for most US rail lines. Which is unfortunate. There's something rinky-dink about having to use a stool to get into the train. Not to mention all the accessibility problems. With low floor trains no high platforms are needed and accessibility is granted. For example in Switzerland the platforms are only 55cm high. The new rolling stock allows for barrier free boarding with no problems. Some older trains are retrofitted so that at least one carriage is low floor. And for double decker a low platform height is even an advance. The problem is that in the US, imported trains cannot run with mixed traffic so the need to have separated tracks or run freight only when no passenger operation is running. Using heavier rolling stock reduces performance (acceleration, top speed)considerable and also costs more. Further there ere much more trainset from non US manufacturers. So rail is less competitive than in Europe. I'm not a maglev fan myself either. I think it's an overly costly system with a low yield return for the investment costs. Even if it could compete better with speed against the airlines, I just do not think the invest will pay off overall. Brought to you by the governor own Twitter page (through the Infrastructurist)... I give you: The Fly California Siemens Velaro (and a very weirdly smiling man). 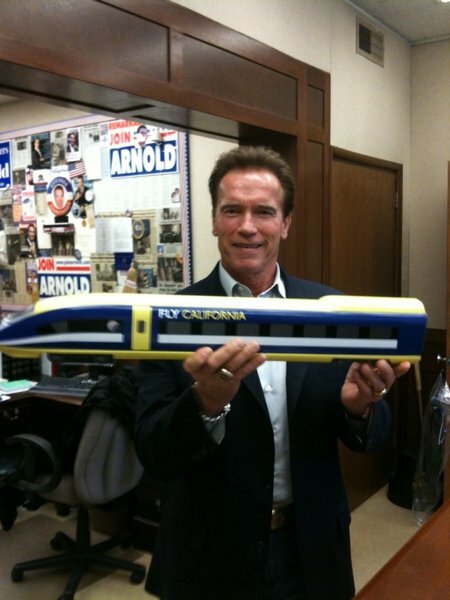 I hope that's not the closest thing that California is going to get super high speed train. Pft, CA is lucky to get guided busways with their budget issues.